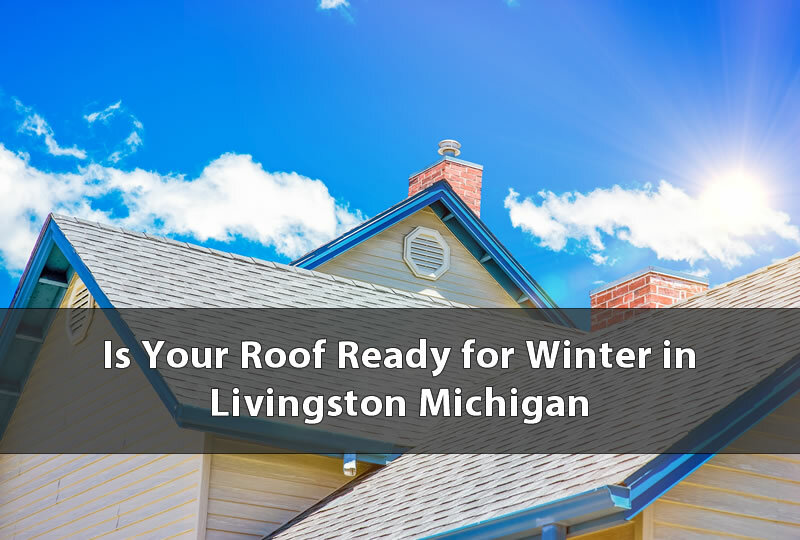 Winter is fast approaching here in Livingston County Michigan and if your home’s roof isn’t ready then you may be facing some pretty serious problems once the snow and rain come pouring down. There are some things that you as a home owner can do to ensure your roof performs as it should this winter. In this article I’ll discuss some of the things that you can do to make your roof ready for this winter. I’ll include some of the things that you’ll want to also get a professional roof contractor like Livingston Roof Pros to do as well. Having a roof leak in the middle of winter can be difficult to locate and also fix. Once snow gets the roof completely covered then it can present loads of problems and make repairs more difficult. That’s why it’s so important to get the roof in good shape before problems start to show up. Using the list below you can help to do just that and avoid some costly mistakes and problems that may occur. The first thing you’ll want to make sure of before winter gets here is that the gutters on your home are clean and flowing. When the gutters on your home are blocked it can cause melting water to remain in the gutter and then later freeze causing lots of weight on the gutter. As more and more water freezes on the gutter the more weight will be added and it can eventually damage the gutter or cause it to completely fall. Keeping your gutter clean can also help stop icicles from forming on hangovers as well. Is There Debris on the Roof? Another big problem that can really damage your roof and cause it to really age prematurely is debris left on the home’s roof. When leaves fall onto the roof and gather in areas it is important that you have that debris removed before it snows on top of it. Debris that remains on the roof can hold moisture against the roofing surface. Over time this can cause loads of problems including causing the roofing materials to age prematurely. Another effect of debris on the roof is that it can cause the roof to become discolored and different than other areas of the home’s roof. Having these pockets of debris can also cause the home’s roof to look a bit weird when covered in snow with lumps here and there. It is important that you don’t attempt to remove the debris yourself or attempt to climb onto your home’s roof. You can be seriously injured or even killed by falling from your home’s roof. Make sure you either clear the roof from the gound if possible for lower roofs or get a professional roofing company in Livingston Michigan to clear the roof for you. When Was Your Last Roofing Inspection? Getting your home’s roof inspected each year can help to locate problems before they actually happen. If it’s been more than a year since the last time your home’s roof was inspected then it’s best to get a roof inspection done before winter. Once the home is covered in snow and the roof is not readily accessible a roof inspection may be out of the question and not really available. If it’s been more than a year then you may be able to get an inspection of just critical areas of the roof even after snow has fallen. Be sure to contact Livingston Roof Pros to learn what options are available to you.